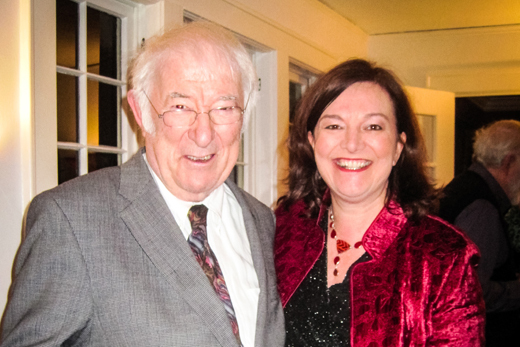 Geraldine Higgins and Seamus Heaney, pictured during Heaney's last visit to Emory in March 2013. Credit: Courtesy Geraldine Higgins. Geraldine Higgins, director of Emory University's Irish Studies program, will discuss "Seamus Heaney: The Place of Writing" on Thursday, Sept. 18 at 6:30 p.m. in the Jones Room at the Robert W. Woodruff Library. The presentation is in conjunction with "Seamus Heaney: The Music of What Happens," the exhibition currently on display in Schatten Gallery at the Woodruff Library through Nov. 25, 2014. Materials on display are drawn from the Seamus Heaney papers at Emory's Manuscript, Archives, and Rare Book Library (MARBL). Higgins will talk about the process of curating the exhibition, which celebrates the writings and personality of the late Irish poet and Nobel Prize winner. It features materials from MARBL's unique archive including manuscript drafts, photographs, letters and the surface of Heaney's old writing desk. Curatorial assistants Maggie Greaves and Emily Leithauser will also share their behind-the-scenes stories while preparing the exhibition. Light refreshments will be served.